This section contains information related to Virgin Express, flight code TV, a low-cost carrier original type. "In April 1996 Richard Branson's Virgin Group acquired 90% of EBA Express and transformed the unknown Belgian airline into one of Europe's leading low-cost brands. From the very beginning, the plan was as simple as it was radical: to make flying the most convenient, most comfortable and best value way to get around Europe. Following the common ownership of Virgin Express and SN Brussels Airlines in May 2005, there are big plans afoot to give more people than ever the chance to fly as often as they like for a price they like." 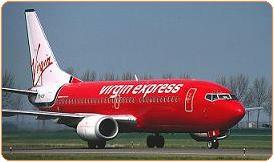 Virgin Express is owned for 88,6 percent by Virgin Airline Holding, the remaining percentage is listed on the stockmarket. Click to browse to the network development section of this site, featuring more more information on the network development of Virgin Express.